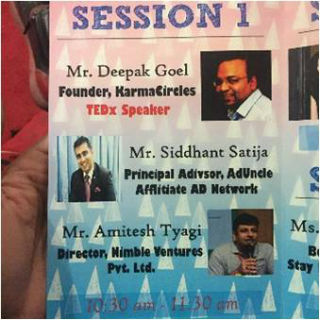 Entrepreneurhsip club members from JIMS PGDM programme attended the LEAD Start up Conclave at Maharaja Agrasen College,Delhi University on 28th January, 2016. The event had speakers with immense experience and knowledge. It was aimed at sharing the Ifs and Buts of Entrepreneurship challenges. Mr. Amitesh Tyagi, director Nimble Venture Ltd.talked about his work and struggle and summed up by saying that don't be a CEO,be like a salesman. Mr. Deepak Goel, Founder, Karmacircles insisted on thinking of an idea from the perspective of "Solving a problem". In his opinion one would think better if he thinks from the perspective of a solution provider. Ms. Suchita Salvan, CEO of LBB interacted with audience and shared her struggle as well as mistakes she made in her startup and quoted " have a Ph.D in your idea". 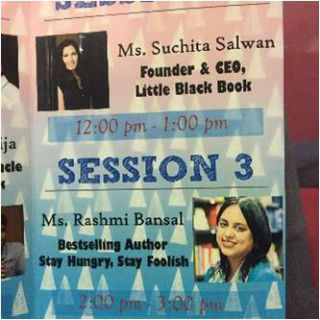 Session was convincigly brought to an end by Ms. Rashmi Bansal author of the Best seller" stay hungry stay foolish", who said " ordinary people are capable of doing extraordinary things". It was a platform that was not only motivating for future entrepreneurs but also for those who will one day become intrapreneurs.